The UK government has made radical changes to how students are assessed during Key Stage 3 (KS3). Gone are National Curriculum levels – schools now have the freedom to develop their own methods of assessment. Schools are encouraged to see KS3 as preparation for GCSE’s, so the curriculum and assessment in Years 7-11 should be designed to fully prepare students to achieve their potential and beyond in their GCSE exams. Expectations of what students should be able to do and understand, called ‘Age Related Expectations’, have been raised considerably and the Federation of St John’s and King Richard Schools have responded to this in the design of our new assessment model. When a student enters KS3 they will be placed on an Assessment Pathway. 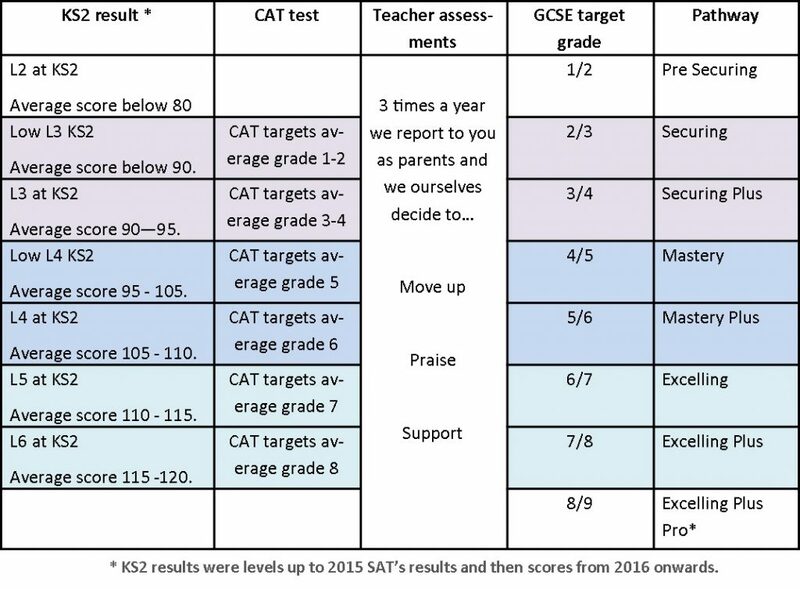 We use KS2 scores, the data from the CAT tests (which all students sit on entry), and any other relevant information from a student’s previous school to decide which pathway a student should follow. KS3 assessments in all subjects, are designed to challenge students on the pathway that they are working on. Students are encouraged to use the ‘Assessment For Learning’ criteria, which is underpinned by Bloom’s thinking skills, to achieve their potential and beyond. We have designed our assessment model with a ‘growth mindset’, believing that all students can achieve their full potential – given the correct support, opportunity and challenge to do so. The diagram below explains the pathways and how they relate to GCSE attainment. For further information – please download our flyer which explains assessment in more detail, including information on reporting and parents afternoons. Click on the link below to see some exemplar assessment sheets. These demonstrate how work in the different pathways is designed to challenge all students. There is no limit to the pathway a student can achieve and if a student is working above their school pathway in a number of subjects their pathway will be reviewed and raised. GCSEs are undergoing a great deal of change at the moment with GCSE grades in 2017 in English and Maths being awarded as a number from 1-9. In 2018 most other subjects will move to awarding grades from 1-9 and in 2019 all GCSEs will be awarded numbers in place of letters for GCSEs. The progress and attainment of students at Key Stage 4 have traditionally been shown in the number of students gaining 5 or more GCSEs at grade C or above including Maths and English. This measure has also been replaced by Progress 8 which takes into account a student’s best 8 GCSEs from a balanced curriculum and looks at their progress from Key Stage 2 to Key Stage 4.